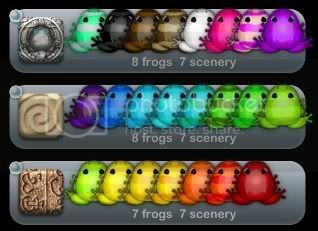 EG: Breeding Glass Chroma Ludo and Maroon Tingo Ludo with aim of 2 frogs - Glass Tingo Ludo and Maroon Chroma Ludo. When both are successfully bred, Maroon Tingo Ludo is moved out of same habitat as the Glass Chroma Ludo, and next ones are moved in (or in this particular case, Glass Chroma Ludo is sold, and start breeding Black Picea Ludo and Cocos Cafea Ludo aiming for Black Cafea Ludo and Cocos Picea Ludo). Ah, ah, ah, of course. You can get two desired frogs with that method rather than one at a time as I do. Another strategy that I have come across is breed multiple species for colour - similar maturation rates. So breed Red Tingo X with Red Carota Anura untill all the X are bred. Then when they are mature breed Red Carota X with Red Aurum Anura until all the X are bred. I think I'm going to give both these suggestions a try in my next batch(s). I'm also going to move to a higher level of frogs because I see all those cow print patterns in the low levels and I'm pretty sure I'll go bug-nutty breeding all of them. I tend to check after two breeding attempts, but I have a few habitats full of color coordinated frogs, so I don't have as much space for eggs as I probably should. I often get streaks where two attempts per combo is all I need, but I think when I move on to doing two patterns at once I'm going to have a big clean out and open up all the habitats I can. I'm breeding 8 patterns at a time to complete the 100%. I breed through all the frogs in one habitat, getting every combination of pattern and pattern color. Going through both habitats in a pair gets me 100% for the 8 patterns in that base color. When I finish all three pairs of habitats, I rotate in another 3 base colors. And of course, I never wait for the frogs to grow. I just sell each batch off as eggs and then check the Froggydex to see if I was successful. WOW. OK, I'm pretty sure I'd get very confused trying to juggle all those at once, but I'm going to try to do two at once next, so if I can get into the groove of it, it's good to see how you've expanded that idea. I remember you had some good advice about Pocket Frogs economics before, so this is interesting. Do you have a favorite pattern(s) you breed as your cash crops? I breed batches of high value frogs in colors I like for coins, but at the high end they take a long time to mature. Then again, I like juggling frogs for a few minutes, then putting them away for a few hours until lunch - which allows the brood to mature in the lower-level frogs anyway. So since that play-pause method suits how I roll, it's fine for now. But I'm going to have to re-think that and maybe move to your method when I start trying for 100% on breeds that take more than 2-3 hours to mature. I remember you had some good advice about Pocket Frogs economics before, so this is interesting. Do you have a favorite pattern(s) you breed as your cash crops? Er, I realized I was being lazy and did some figures on the back of an envelope sort of way. It looks like the higher level frogs really do pay the best per hour. I was thinking of the WR method which is that the quicker turnarounds pay the best, but they make up for it in annoyance. But this is great because I love breeding the Magus and Signum patterns. Do you have a favorite pattern(s) you breed as your cash crops? Just whatever I have that sells for the most. Right now it's glass chroma magus, but really, anything going for over 10,000 a frog is good. I don't worry about coin/hr rates because I often go for days without checking in on them. I think the main thing is to have all the habitats that you can. I have one for coin and weekly set breeders, one for growing out the weekly set or special requests, the nursery, the six for "100%" breeding, and the rest (7, I think) are all for growing out coin-breeds or non-anuras leftover from weekly set breeding. Actually, it's not confusing or juggling or anything like that. It's extremely methodical. I'll try to post a pic when I get home tonight and explain it in greater detail. OK, since yesterday I've been trying something like EvilMummy's method with my crustallis. I already processed the brown, black, and glass frogs from the bottom row - that's why there's only whitey down there. And, as I work this way, I see that the other colors I'm not working on are filling up too, so at some point this will get really quick. I cleaned out all my spare habitats and now have 9 empty and the nursery to store eggs. After a round of breeding, I take a break and let them mature (I have to go to work and stuff after all!). Then come back, sell them off, and start with the next batch. I have a couple of different strategies for breeding frogs. I am breeding sequentially and started from Anuras. I am now on the Level 9 frogs and will finish those soon moving to Level 10. When I started with Anuras up through level 4, I would do something like EvilMummy's plan. But around Level 6 or 7, this plan becomes too onerous because the breeding time is so long. Also, too, I don't sell upper level (like 4 and above) frogs before they grow halfway because it gets expensive. I have a lot of coins now, but I didn't when I starting breeding like this. 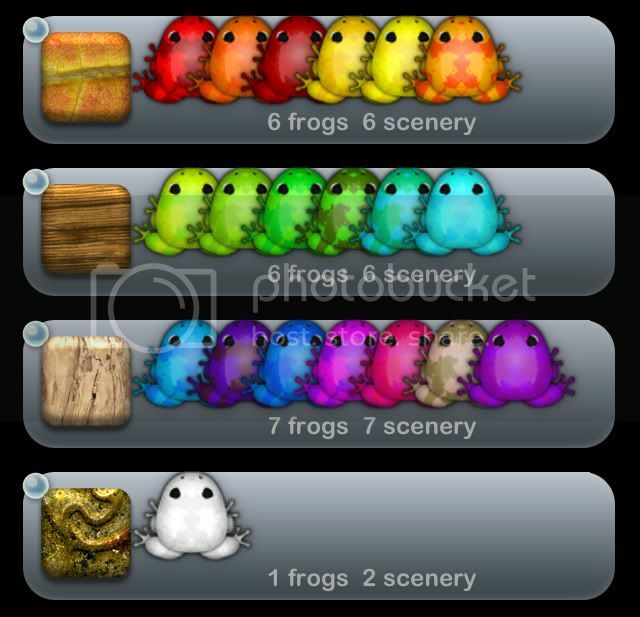 Now, I do the following: I have glass chroma versions for all upper level frogs and I buy anuras for each color as I need to breed. I breed a chroma version of each color frog I need and then I breed that frog with an anura with the color and secondary color. For example, right now, I am making Violet Sagitta, Amfractus, and Orbis all secondary colors. Long ago I made glass chroma versions of these three. A couple of days ago I made Violet Chroma versions of these three breeds. From the froggydex, I buy Violet Anuras in color sets and breed the violet chroma sagitta, amfractus, and orbis frogs with the anuras until I have full Violet sets of these three breeds. When I am done, I will start on the White ones. The reason I started with this strategy is that this helps reduce my breeding time since I can only have 4 options for any given pairing (except the occasional 3 options, which does not please me). This really does help me breed quicker, despite the fact that the growth time is quite long. 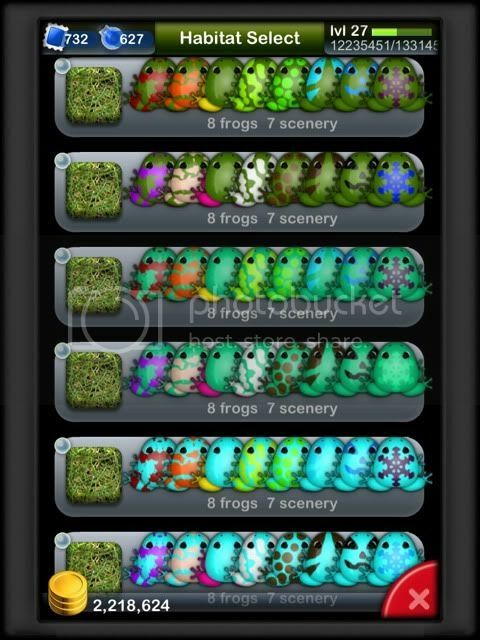 You need to have coin to buy the anuras each time, but if you have access to upper level frogs you can breed and sell, it shouldn't be a problem to buy anuras from the Froggydex. This sounds somewhat like how I did my first two 100% sets, with a little variation. I too like to let the frogs mature enough to at least break even, so I can see how this is a method to keep around for higher levels. Over the past day I've sold a few batches off as eggs as Ava would, and at least in the low levels it's not really much of a hit because I do breed a habitat of high-level frogs to sell every other day. So that offsets the loss on low-level brood. I wonder how long that method would hold out, or if I'm just too nervous about selling eggs at a loss even with other sources of income. Well, with 10 empty habitats now, if i do run low of cash I can take a two-day break to breed a slew of magus's and be fairly well off. As promised, here is my breeding method in detail. I do three base colors at a time, each with a pair of habitats that hold all 16 pattern colors and 8 patterns. For each color, I start with the crustalli. I check to the Froggydex to see what frogs I'm missing for that base color and pattern: Crustalli -> Olive -> pattern colors. I breed the crustalli in the first habitat with other frogs in the first habitat with needed pattern colors, then repeat in the second habitat, repeating as necessary until Crustalli->Olive is at 100%. Then I move to the Velatus and repeat with that one, and so on down the line. By the time I finish all six habitats, I have 100% of three base colors for 8 breeds. Odds for each breeding are 1/4 because the base color is the same. Sometimes I do a full 8 matings for a single pair of frogs, but more often I do 2-4 different matings in each batch of 8 (seems to go a little faster that way). All eggs are sold immediately to make room for more breeding. Although technically I could put them in the grow-out habitats, that space is better used for growing out very expensive frogs like my coin-breeder glass chroma magus. All eggs are sold immediately to make room for more breeding. Although technically I could put them in the grow-out habitats, that space is better used for growing out very expensive frogs like my coin-breeder glass chroma magus. Oooh, as usual, you're very insightful with the frogs. I had looked at your habitats last night, but the description along with the picture totally makes it clear. I did assume you must know what you're doing as you always have way more coins than me, but I have a hard time looking past the most basic profit/loss computations. If only I could apply your insights to my real-world accounts so easily. I think We Rule is such a tricky game stats-wise that it's easy to let the tendency to overthink things bleed over into other games that are much simpler. Fortunately my Pocket Frogs play has always been very casual, so I always just did the obvious thing: breed the most expensive frogs. And what do you know, that turns out to be a very good strategy in Pocket Frogs. For a while I thought my mass quantities of coin had just built up over time, as I've been playing for maybe 1.5 years. But then when the new habitats came out, they were very expensive and completely depleted my coin reserve. So I went on a coin-breeding binge, and it turns out it only took a couple weeks to get back to 2 million-ish. Now any time I dip below that, or just have some time I'm not really playing, I just breed some more glass chroma magus frogs. I think around Level 7 frogs, selling the frogs before they mature in bulk starts getting expensive. It can add up before then, but you can burn through several thousand coin at Level 7 before you know it. I play on my phone as well. As you said, the size works out great for hopping, and it's not too big a distraction to have at work. I can breed a few frogs on break and walk away from it without sinking much time into it. Other games I keep only on my iPad so that I don't get tempted to check on them while at work. Congratulations on 30%! I just got halfway there to 15% and was feeling pretty good about that.